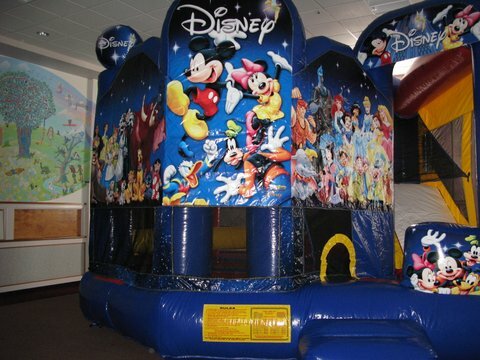 World of Disney 5 in 1 Combo This licensed World of Disney 5-­‐in-­‐1 combo bouncy castle brings a magical Disney experience to any party or event. Kids have hours of fun in this oversized inflatable with the slide, basketball hoop, jump space, vertical pop ups and horizontal climb ons,. This bouncy castle offers five panels of brilliant digital artwork, featuring all the beloved characters such as Mickey and pals, the Disney Princesses, Peter Pan, Alice in Wonderland and more!